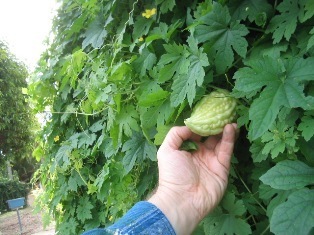 A few days ago I was at my friend Trevor’s organic market garden here in Perth, admiring his handsome bitter melon vine that runs the full length of the street frontage. 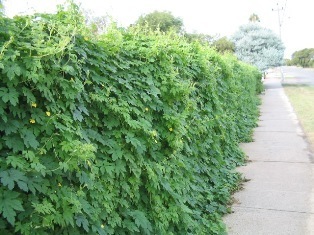 It’s very prolific, heavily foliated and green, with lovely yellow flowers, and replete with melons which hang invitingly under its sprawling leaves. When I was living there a couple of years ago we had a bumper crop over summer of up to 10kg a day. A prolific and generous plant. And it self-seeds, as nature intended – the unpicked fruits that hide amidst the tangle of foliage ripen to a bright red and just sort of melt away, dropping to the ground and spilling their big, flat, jet black seeds for a guaranteed next-year crop. 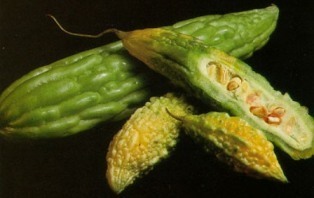 Bitter Melon (Momordica charantia) is a member of the Cucurbitaceae (gourd) family, and a relative of squash, watermelon, muskmelon, and cucumber. There are different types of this healthy vegetable. Trevor grows what I can ascertain to be the Thai variety, pictured below. The one grown in India appears more slender and spiky, being saw-toothed like crocodile skin, with seeds that are small and tightly packed in the flesh, as pictured below next to it’s bigger cousin. Here’s a link to a great bitter melon page with photos and nice Bengali recipes, by the way. In the ancient Indian medical science, Ayurveda, bitter melons are well-known for their ability to cleanse the blood, aid digestion, help cure diabetes and encourage a failing appetite. Fried chips of bitter melon are well-loved in India, and are generally eaten in small appetiser quantities at the outset of a full lunch or dinner. To reduce their bitterness, the melons are rubbed in salt before cooking. You’ll find bitter melons in Asian and Indian food stores. Always look for small melons that are dark green in colour and heavy for their size. Trim the ends off the bitter melons. 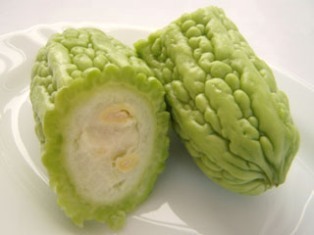 Slice them in half lengthways, remove the seeds and then slice them lengthways into long strips, 0.5cm (1/4-inch) wide. Cut the strips into lengths about 3.75cm (1/1/2 inches). Alternatively, cut each half crosswise to yield semi-circular strips of melon. Place the bitter melon pieces in a bowl, sprinkle liberally with salt and place a weight on them. Set them aside for at least half an hour. Rinse the melon pieces under running water and drain them. Pat them with paper towels until they are almost dry. Pour 5cm (2 inches) oil or ghee into a deep-frying vessel. Place the pan over moderate heat and bring to a temperature of 190 C/375 F.
Sprinkle the turmeric, cayenne and flour over the melon pieces and toss gently to coat. When the oil is hot, drop in a small handful of flour-coated melon chips. Fry them for about 2 1/2 minutes, or until crisp and golden. Remove and drain them on paper towels. Fry the remaining bitter melon chips in batches. Serve hot, warm or room temperature. For extra crispness, I like to double-fry the melon chips: allow the cooked chips to cool, then fry again briefly in hot oil. Hell, No! We Won&apos;t Go! A friend just sent me this interesting article on Roman Catholic doctrine. they risked “eternal damnation – the inferno”. gift, an offer to mankind”. speaking in “straightforward” language “like a parish priest”. inconvenient or embarrassing aspect of belief. is the goal of human life”. separate themselves from God, the source of all life and joy”. hypothesis” and not a “definitive truth of the faith”. Because I teach there. Or at least I did last year, and MAYBE this year or next year. If not I will disconnect the link. Well, all (100%) of the cookery schools at which I teach cook meat. Almost every home in which I teach cooks meat. Almost all the students who attend my classes eat meat. The world is awash with meat! What’s a vegetarian chef to do. Teach!!! If I don’t extend myself and go to such places, how will people ever learn an alternative way of eating? That’s a tough one P. I really can only suggest you impress on them, lovingly but firmly, that it causes you distress. Then if they continue, what can be done? Tolerance is the only recourse. I recently had direct personal experience of this identical scenario. Sometimes it was very disturbing. But amidst all the commotion, we should know for sure that all things change, nothing stays the same. The disturbances of this world come and go, and in the mean time, we must learn the subtle, delicate and sometimes very difficult art of forbearance. Amazing that you still remember that wonderful dish! It’s the ultra famous halava. Here’s a similar recipe. Semolina halava is the most popular dessert served at any of the Hare Krishna restaurants worldwide. This version of the famous hot, fluffy pudding with juicy raisins, raw sugar, and walnut pieces rates high in the “halava-top-ten”. I have cooked halava for 4 or 5 persons and for 1500 persons; either way, following the same basic steps yields equally stunning results. The secret of good halava is to roast the semolina very slowly for at least 20 minutes, with enough butter so as not to scorch the grains. Steam the finished halava over very low heat with a tight-fitting lid for 5 minutes to fully plump the semolina grains; then allow it to sit covered for another 5 minutes. Fluffy, plump grained halava is best served hot, on its own, or with a spoonful of cream or custard. Serves 6 – 8 persons, or a couple of halava addicts. Combine the water, sugar and orange zest in a 2-litre saucepan. Place over moderate heat, stirring to dissolve the sugar. Bring to the boil, then reduce the heat to very low and cover with a tight-fitting lid. Melt the butter or ghee in a 2- or 3-litre non-stick saucepan and over fairly low heat, stirring occasionally. Add the semolina. Slowly and rhythmically stir-fry the grains until they darken to a tan colour and become aromatic (about 20 minutes). Add the walnut pieces about halfway through the roasting. Stirring more carefully, raise the heat under the grains. Raise the heat under the sugar water and bring the syrup to a rolling boil. Remove the saucepan of semolina and butter from the heat, slowly pouring the hot syrup into the semolina, stirring steadily. The grains may at first splutter, but will quickly cease as the liquid is absorbed. Return the pan to the stove and stir steadily over low heat until the grains fully absorb the liquid, start to form into a pudding-like consistency, and pull away from the sides of the pan. Place a tight-fitting lid on the saucepan and cook over the lowest possible heat for 2 more minutes. Turn off the heat, fold in the dates and banana, and allow the halava to steam, covered, for an additional 5 minutes. Serve hot in dessert bowls as it is, or with the toppings suggested above. Today I received a letter from Shrinivas Venkatesh, in Mumbai. It’s rather sad, though not at all unexpected, that Indian science textbooks are now promoting a non-vegetarian diet in a land that was once the home of vegetarian food, and a shining beacon for all things spiritual, including Ayur Veda and the science of what foods to eat. Under normal circumstances, supplying a vegetarian recipe originally from India to someone in India would be a strange thing – sort of like ‘supplying coals to Newcastle’. But of course, India these days is actively indulging in animal slaughter to gratify the lascivious appetites of it’s growing number of carnivores. The phrase, “carrying coals to Newcastle,” means spending an inordinate amount of energy on something useless, fruitless, or redundant. This idiom arose in the 15th century because Newcastle, England was known throughout the country as a major exporter of coal. Therefore, “carrying coals to Newcastle” would do you no good, because there was more coal there than anywhere else. Variations on the saying include “bringing,” “taking,” or “moving” the coal. In Poland and Sweden, you’d hear, “bringing wood to the forest.” Some regionally specific idioms for redundancy include Russia’s “taking samovars to Tulu,” a city famous for its spigotted teapots. The Greeks spread the saying, “bringing owls to Athens,” since the night predator is a symbol of the ancient city named after the goddess Athena. Of course, I don’t consider it useless supplying a recipe to young Shrinivas, as the above contextualized saying suggests. Newcastle in fact did, for some time, import coal from Russia in times of emergency coal-miner strikes. So one could also say that due to the rapidly advancing degradation of Indian culture, which in itself is an unfortunate emergency, any opportunity to remind Indians of their glorious culture is timely. So I provided Srinivas with a recipe, for the famous Khichari – the most perfect, wonderful and nutritious of all vegetarian foods from a vegetarian kitchen culture that still is the most wonderful in the world. Khichari is a nutritious stew featuring dal and rice. There are two main varieties thin (geeli khichari) and thick (sookha khichari). Whichever way you prepare khichari, it will soon become a delicious favourite. The following recipe is for the thicker variety. Khichari is an ideal breakfast food, wonderful when accompanied by yogurt and fresh hot puffed fried breads (pooris) or toast. I always serve khichari with a wedge of lemon or lime. Not only does this add a delightful nuance of flavour, but it lends nutritional advantage also: there are good sources of iron in the dal and vegetables in khichari, and the lemon juice, rich in vitamin C, helps your body absorb it. This recipe is mildly spiced. Adjust your own spicing as required. Serves 6-8. Heat the ghee in a heavy 4-litre non-stick saucepan over moderate heat. Sprinkle the cumin seeds into the ghee. When they turn golden brown add the chilies and ginger. Saute them for a few seconds; then add the turmeric and asafetida. Add the vegetable pieces and fry them for a minute or two. Stir in the lentils and rice, stirring with the spices and vegetables for a minute. Pour in the water and bring to a full boil over high heat. Reduce the heat to low, partially cover and slowly cook, stirring occasionally, for about 30 minutes or until the lentils and rice are soft. If the khichari dries out too much, add up to 1 cup warm water. Fold in the salt, butter, cooked green peas, chopped tomatoes, toasted cashews, and the chopped fresh coriander leaves, allowing them to warm for one minute. Serve hot. Our cooking class yesterday, held at my place, went well. Here’s our team, on the brink of lunch. The theme of the day was “The Indian Shared Table”. Pictured below are the Soft Cashew-Studded South-Indian Steamed Semolina Breads (Rawa Idli), Spicy Hot-and-Sour Toor-dal (Sambar), Chili, Curry Leaf & Mustard-infused Coconut Chutney, Succulent Eggplant & Panir Cheese in Spicy Tomato Glaze, and the gossamer-thin Crisp and Puffed Fried Wheat Breads (Poories). I saw a travel documentary snippet yesterday on Thailand, noting the saffron-robed monks begging for food, then ‘chowing down’ on a meat-and-rice lunch. It reminded me of a letter I attended to on the subject of Meat Eating & Buddhism. Check it out. Purusottama Ksetra from Cape Town asks: Could you please help us with a recipe for scones? I reply: Here’s a nice recipe from my latest cookbook. The best scones I ever ate were in Devon on a holiday as a boy with my family. I can still clearly picture the little teahouse, and the warm scones, buttered and slathered with clotted cream so thick that it stood up on its own, a dollop of strawberry jam at its peak. Making good scones is not difficult, and they get easier with practice. The two golden rules of scone making are these: Add the wet ingredients to the dry, and mix the dough as briefly and lightly as possible. And remember, the lighter the touch, the lighter the scones. Makes 12 Scones. butter, jam and cream to serve. Preheat the oven to 230° C / 450° F. Brush a baking tray with butter. Sift all the dry ingredients together in a bowl (sifting aerates the mix). Rub the butter into the dry mix briefly and lightly, using your fingertips, until fine and crumbly. Make a well in the centre of the dry ingredients, and add almost all the buttermilk. Mix, using a knife in a quick cutting motion while rotating the bowl. The mixture will come together in small pieces. Mix in the rest of the buttermilk if the mix is too dry. Gather the dough together, and turn it out onto a clean, lightly floured surface. Knead the dough very lightly, folding it back over itself, pressing down, and turning, for 30 – 40 seconds. The dough should have just lost its stickiness. Roll or press the dough out to a flat round about 1.5cm (½-inch) thick. Cut out rounds of about 4 cm (1½ inches). Pile the scraps together and press or roll out, but don’t re-knead them. Bake the scones for 10-12 minutes, or until well-risen and golden on top. Remove from the oven. For soft scones, wrap them while warm in a clean tea towel. For scones with a crisp top, transfer to a wire rack to cool slightly. Serve with butter, jam and cream. Note: The lightest scones are those made with buttermilk, although you can also use milk, or soured milk. Scones made with cream are the richest, with a very smooth taste and texture. The traditional scone can also be varied with the addition of raisins (as in above photo). Scones should be eaten within a few hours, but they can be frozen in a bag for up to three months. The guests are on their way. I’m bringing the milk to a boil for a juicy batch of homemade panir cheese. All is well with the world. This material sphere is a reflection of spiritual existence. “There is a banyan tree which has its roots upward and its branches down and whose leaves are the Vedic hymns. One who knows this tree is the knower of the Vedas. (Bhagavad-gita, Chapter 15. The Yoga of the Supreme Person). On that cryptic note, I conclude my four-day kitchen marathon. Yesterday’s cooking expedition led me to the delightful home of Denise, the head of a Western Australian Health department, for a team-building day in the kitchen. Craig (pictured, front left) who had done a class with me before, had suggested this would be a pleasant way to spend the day. Indeed it was. Here’s the ebullient ladies responsible for preparing our Rujak Manis. A big thanks to Denise (pictured front, right).